Every pilot knows that without an understanding of aerodynamics, modern flight would be merely a fantasy. Aerodynamics, which means “air in motion,” was studied by Aristotle and Archimedes as early as the 2nd century. By the 1700s, aerodynamicists like Isaac Newton and Daniel Bernoulli developed theories that would lay the foundation for heavier-than-air flight. But it wasn’t until 1799 that George Cayley envisioned of a fixed-wing aircraft and officially identified the four fundamental forces of flight that we know today: lift, thrust, drag, and weight. Each of the four forces of flight act independently, but keeping them in balance ensures you maintain control of the aircraft. Here’s a closer look at the four forces of flight and how each plays a role in aircraft control. Perhaps the most importance force to a pilot is lift. Lift directly opposes the weight of the aircraft to keep it aloft. As the aircraft moves faster, lift increases until its force is equal to weight. When equilibrium between weight and lift is established, the aircraft is pushed upward. While lift is produced by every part of the aircraft, the wings create most of the lift used by the airplane. Weight opposes the force of lift in flight, directing down toward the center of the Earth. Weight is distributed throughout the airplane and includes the mass of all the aircraft’s parts, fuel, passengers, baggage, and/or freight. However, the weight of an aircraft and its center of gravity also constantly change as fuel is consumed during flight. For this reason, pilots must frequently adjust controls in flight to keep the aircraft balanced. Drag is the aerodynamic force that opposes the motion of the airplane through the air. Drag is caused by both friction (parasite drag) and the generation of lift (induced drag). Many factors affect the magnitude of drag, including the aircraft’s size and shape, velocity, and the properties of the air flowing past the aircraft. Pilots have some amount of control over the force of drag by changing speed or streamlining the aircraft’s body design. Thrust is the force that’s generated by an aircraft’s propulsion system to counteract drag and move the aircraft through the air. When the forces of thrust and drag are equal, the aircraft is balanced and flies at constant airspeed, but when thrust is greater than drag, the aircraft is able to accelerate and climb. 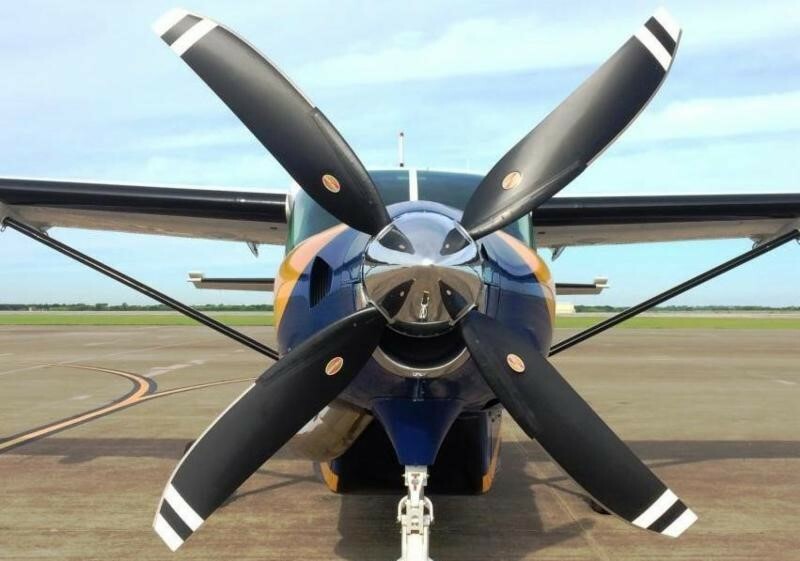 Powered by the aircraft’s engine, the propeller creates a difference in air pressure between the front and back of the propeller blades and pull the aircraft forward.